… Spring bulbs and garden birds. It is great to see the bulbs starting making their way through the surface of the soil - or lawn in my case. It’s also great to see a bird species return to the garden once again. I wonder if you can tell which one by the eggs below. The image below is not from my garden but courtesy of Wikipedia. Perhaps you might get a clue if you look closely at the patterns of the speckles. A few days ago I was thrilled to see the return of the Song Thrush. It’s been a while since we’ve seen it. Spotted on the ground in the area where I scatter sultanas, it was seen waiting for the blackbirds to scuttle off before it ran in to feed on the sultanas that were left. Once it left I opened the window and threw some more sultanas out on the ground. I don’t know what it is about this bird but I do find its visits rather special. Yes, they are rated on the red list by the RSPB but that’s not just why I like to see them. Perhaps it’s because they are shy and almost polite in their visits. Or perhaps it is the upside down heart pattern on their bodies and the fact that each bird appears to have a slightly different pattern making it unique. The Song Thrush has been seen on two mornings. Although it was a dull morning when the photo above was captured I am still delighted with it. It is a pretty bird isn’t it - fit to brighten any dull morning! I love the way it almost bounces along the ground – much more sedate than the blackbirds that jump along. Perhaps it is its shy behaviour that I like - again quite different from the speed and confident moves that the blackbirds make. Thrushes often stand with their head tilted to one side when they are searching for food and picking it up as you can see with the sultnana in the photo above. They clearly have strong neck muscles by the force they use to break the shells of snails to get them out. Unfortunately for them after the effort of smashing the shell on a rock it doesn’t necessarily mean they always get the snail inside! Blackbirds are often not far away and will very quickly run in and take the snail before the Thrush gets near it. I guess that’s the way out in the wild – there’s always someone watching where you find food. It’s all about survival. Plants are no different - they just want to grow even when out of soil like the bulbs that have been sitting in their bags in my shed. Oops… some still are! Okay… but I did get a few planted today before the winter cold and snowfall expected. In fact, it was quite a pleasant morning in the garden today. No sunshine but no cold winds as expected either which was a huge bonus! Yes… today was the first of February and I was out planting daffodils! Okay... the back of this pack did say 'plant between July and December' so this perhaps will be a test case to see exactly how late they can be planted. I bought these bulbs a couple of weekends ago at an absolute steal. Yep… three bags at 50p each they really owe me nothing but I’m still very positively looking for a great (albeit later) show of flowers! The garden centre clearly needed to get rid of this stock of bulbs as the buds were already breaking through. Healthy bulbs are firm, which these were, so I have no reason to assume that they won’t flower in their own time. The only problem was where to put them – being small my garden doesn’t have too many free spaces! After a bit of thought I decided to plant some in a pot and some in a couple of pond baskets filled with soil and dropped in a border (with a gravel mulch) next to my Arbour. I’m thinking about changing this border this year so this will safeguard the bulbs as the baskets can be lifted later. However the main planting I wanted to make a feature with. An avenue through one side of my walkway seemed the way to go. The yellow dots in the photo above show where I planted them. This photo was taken when this gravel path was put down back in August 2000. You can see the breathable membrane put down to stop weeds coming through. 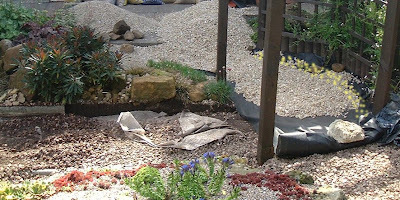 Today, I had to rake back the gravel, make a trench (cutting back the membrane as required) add some fresh garden soil, plant the bulbs, cover them with some more soil then rake back the gravel again – job done! There were a number of varieties available when I bought these bulbs but I choose only the one. Hands up… I’m not too fond of yellow in the garden. I don’t mind the small tete a tete daffodils but when it comes to full size blooms I don’t go for the traditional bright yellows. 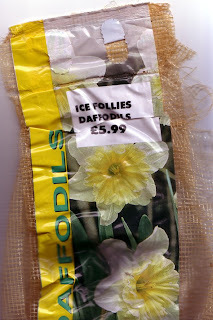 Ice follies were pale with a primrose yellow centre – they would suit me just fine. Ah… but after looking up this variety on the internet I am even more chuffed with it! It appears that this is an excellent variety for naturalizing. Also, the whole flower gradually fades to white – now that’s my kind of flower. Oh yes… and its one of the most vigorous and longest flowering of all the large cupped Narcissus. Now there’s a result I’d say. Okay… so I’d like to give Ice follies a warm winter welcome to my garden! Oh… I have a few other bulbs I’d like to welcome too – the tulips and alliums still in bags in my shed! These I’m going to pot-up and put in my greenhouse – on the to-do-list for this week. I wonder what’s on your garden to-do-list for the coming week. Perhaps if you have a snow covered garden it will be planning for the year ahead and keeping the feeders topped up for the birds. The birds will definitely welcome food and fresh water at this time of year. I hope we see the Song Thrush visit again – I’d better get more sultanas in! The Song Thrush photos above were taken in my garden on January 30th 2009. Lovely song thrush pictures Shirl. The only orange/yellow/red I have in the garden is wild poppies and californian poppies. Otherwise I steer well clear of anything at that end of the spectrum. Jobs for this week... Well, work sadly gets in the way for me. But I do need to get the fence man in to give us a quote/idea what to do. I noticed the Bluebells are coming up today, shame they're the hybrid spanish ones. They make wonderful vases though (to make sure they don't hybridise with my natives) so I'm looking forward to that in the coming months! I'll be looking forward to your cheerful spring bulbs. I'm ready to start my winter sowing, but it is still too early. Your daffodils will be a lovely splash of brightness along that walk. I have a few planted in a pot, but I'm not sure if they'll withstand our icy winter or not. Guess we'll know soon enough! The thrush is adorable. The Song Thrush photos are beautiful. It is fun seeing it eat the sultans. I like the big yellow dafs. I love the splash of color they give the garden in early spring. Yours will be gorgeous too no doubt. What a cool blog! Hope you don't mind me stopping by every now & then. I'm not keen on large yellow daffs in the garden either - much better naturalised in large open spaces or grass verges. 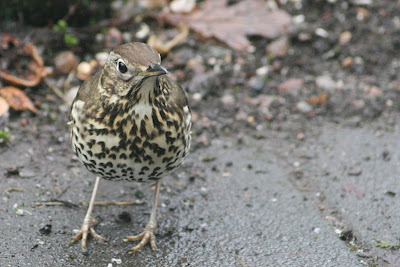 I had a song thrush in the garden yesterday for the first time (and today). I wasn't sure how to tell it apart from a Mistle thrush but now you've mentioned the heart shaped blotches I had another look and it all became clear! Thanks for that. The song thrush is a bird I don't believe we have here, although I haven't researched it so I could be wrong. It is pretty with it's speckles. 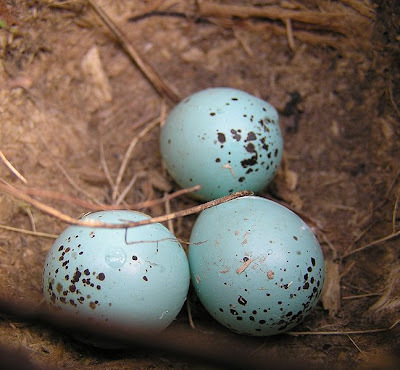 Are those blue eggs that of the songthrush? You have described my predicament with bulbs, too! I still haven't planted mine and I am afraid I won't have many daffodils nor tulips this year, as the squirrels & voles seem to have destroyed what was already there. I didn't get around to putting anymore in and I'm regretting that right now. I looked around and couldn't find any a month ago...so I doubt I'll even have any to put in. At least you had some bags ready to go. The fact that you put them in late is what I would do...if I had any:( It will really be interesting to see if they survive, and when they actually start to bloom for you! Hi Shirl - I've just been planting my daffodils too ;) I think the colder weather this year has worked in our favour. I was expecting to find a mouldy heap in the garage, but they've only just started to sprout - we'll get them blossoming yet! Lovely to see the Song Thrush, we had one visit regularly last year and then suddenly disappear around the same time the Sparrow Hawk was making regular visits. I do hope it didn't fall victim. There was a Pied Wagtail in the garden today no doubt driven in by the bad weather. I don't think they are often seen in gardens and I noticed it was treated in a very hostile manner by the Blackbirds. I hope your daffs do well, I love them, such a cheerful sight after the winter. Nice photos of thrush, these were common in my garden when I was a boy, I have not seen one recently though. Hi Shirl, lovely bird and lovely eggs too. We have a similar wood thrush that was just seen for the first time today, under the feeder with a large group of juncos. First time for those also today. Did our snow cover their normal food foraging spots so they had to come into the open? Ice Follies is a grand one with that frilled trumpet, good score! How comforting to see that someone else is still planting bulbs! I have some crocuses and daffodils that still need to go in. They were out of sight and out of mind until I read your post, so thanks for the nudge! Your thrush pictures are beautiful. First birdsong in our garden this morning - a very tentative, trying it out for size mini dawn chorus of a single blackbird. And on such a grey, dreich day. Exquisite! Hi Shirl, Good to see a posting on Song Thrush's, until recently they were a bit sparce on the ground here, but this last year has seen a bit of a resurgance. Keep a look out, they'll begin egg laying this month. Have you ever been to Farndale in Yorkshire to see the daffodils... if not it's well well worth the visit. Ice Follies is one of my favourite daffs, Shirl, although I'm one of those who never met a daff or narcissus that she didn't love. And the song thrush is wonderful...I've never seen one as far as I know. But my snow buntings are giving us huge pleasure. I am glad that I am not the only one who is still planting bulbs :) I have only just finished doing mine. I am not a fan of bright yellow either, and much prefer the paler daffodils. I have planted 'Thalia' this year in pots. Will have to look out for 'Ice Follies' in the future. The English snowfall was the talk of the town over on our side of the Atlantic! We've had a cold winter as well with two snowfalls in 2009 already! Usually, we don't get any! I'll take it though. It's lovely. My money's on the Ice Follies--tough customers who are good naturalizers for me. I love dafffodils but, like you, shy away from yellow. I am glad to see Rinjveld's Early Sensation, as the first daff, but the others that I plant bi-colors or pinks. Lovely to see the Song Thrush, and to see someone use the word "sultana", so exotic to American eyes!